For the novel, see The Elementary Particles. In particle physics, an elementary particle or fundamental particle is a subatomic particle with no sub structure, thus not composed of other particles. Particles currently thought to be elementary include the fundamental fermions (quarks, leptons, antiquarks, and antileptons), which generally are "matter particles" and "antimatter particles", as well as the fundamental bosons (gauge bosons and the Higgs boson), which generally are "force particles" that mediate interactions among fermions. A particle containing two or more elementary particles is a composite particle. Everyday matter is composed of atoms, once presumed to be matter's elementary particles—atom meaning "unable to cut" in Greek—although the atom's existence remained controversial until about 1910, as some leading physicists regarded molecules as mathematical illusions, and matter as ultimately composed of energy. Soon, subatomic constituents of the atom were identified. As the 1930s opened, the electron and the proton had been observed, along with the photon, the particle of electromagnetic radiation. At that time, the recent advent of quantum mechanics was radically altering the conception of particles, as a single particle could seemingly span a field as would a wave, a paradox still eluding satisfactory explanation. Via quantum theory, protons and neutrons were found to contain quarks—up quarks and down quarks—now considered elementary particles. And within a molecule, the electron's three degrees of freedom (charge, spin, orbital) can separate via the wavefunction into three quasiparticles (holon, spinon, orbiton). Yet a free electron—which is not orbiting an atomic nucleus and lacks orbital motion—appears unsplittable and remains regarded as an elementary particle. Around 1980, an elementary particle's status as indeed elementary—an ultimate constituent of substance—was mostly discarded for a more practical outlook, embodied in particle physics' Standard Model, what's known as science's most experimentally successful theory. Many elaborations upon and theories beyond the Standard Model, including the popular supersymmetry, double the number of elementary particles by hypothesizing that each known particle associates with a "shadow" partner far more massive, although all such superpartners remain undiscovered. Meanwhile, an elementary boson mediating gravitation—the graviton—remains hypothetical.
) is traditionally called positron. 2. The known force carrier bosons all have spin = 1 and are therefore vector bosons. The hypothetical graviton has spin = 2 and is a tensor boson; whether it is a gauge boson as well, is unknown. In the Standard Model, elementary particles are represented for predictive utility as point particles. Though extremely successful, the Standard Model is limited to the microcosm by its omission of gravitation and has some parameters arbitrarily added but unexplained. According to the current models of big bang nucleosynthesis, the primordial composition of visible matter of the universe should be about 75% hydrogen and 25% helium-4 (in mass). Neutrons are made up of one up and two down quarks, while protons are made of two up and one down quark. Since the other common elementary particles (such as electrons, neutrinos, or weak bosons) are so light or so rare when compared to atomic nuclei, we can neglect their mass contribution to the observable universe's total mass. Therefore, one can conclude that most of the visible mass of the universe consists of protons and neutrons, which, like all baryons, in turn consist of up quarks and down quarks. In terms of number of particles, some estimates imply that nearly all the matter, excluding dark matter, occurs in neutrinos, and that roughly 1086 elementary particles of matter exist in the visible universe, mostly neutrinos. Other estimates imply that roughly 1097 elementary particles exist in the visible universe (not including dark matter), mostly photons and other massless force carriers. 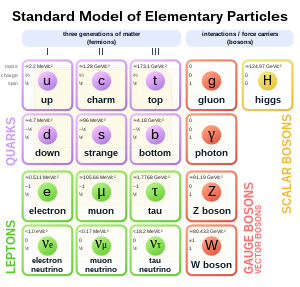 The Standard Model of particle physics contains 12 flavors of elementary fermions, plus their corresponding antiparticles, as well as elementary bosons that mediate the forces and the Higgs boson, which was reported on July 4, 2012, as having been likely detected by the two main experiments at the Large Hadron Collider (ATLAS and CMS). However, the Standard Model is widely considered to be a provisional theory rather than a truly fundamental one, since it is not known if it is compatible with Einstein's general relativity. There may be hypothetical elementary particles not described by the Standard Model, such as the graviton, the particle that would carry the gravitational force, and sparticles, supersymmetric partners of the ordinary particles. τ), which are the only elementary fermions with no electric or color charge. The remaining six particles are quarks (discussed below).
) at 172.7 GeV/c² or 172 700 MeV/c², estimated using the On-shell scheme. Estimates of the values of quark masses depend on the version of quantum chromodynamics used to describe quark interactions. Quarks are always confined in an envelope of gluons which confer vastly greater mass to the mesons and baryons where quarks occur, so values for quark masses cannot be measured directly. Since their masses are so small compared to the effective mass of the surrounding gluons, slight differences in the calculation make large differences in the masses. is the electron's antiparticle and has an electric charge of +1. Quarks also carry fractional electric charges, but, since they are confined within hadrons whose charges are all integral, fractional charges have never been isolated. Note that quarks have electric charges of either +​2⁄3 or −​1⁄3, whereas antiquarks have corresponding electric charges of either −​2⁄3 or +​1⁄3. Gluons mediate the strong interaction, which join quarks and thereby form hadrons, which are either baryons (three quarks) or mesons (one quark and one antiquark). Protons and neutrons are baryons, joined by gluons to form the atomic nucleus. Like quarks, gluons exhibit color and anticolor—unrelated to the concept of visual color—sometimes in combinations, altogether eight variations of gluons. The graviton is a hypothetical elementary spin-2 particle proposed to mediate gravitation. While it remains undiscovered due to the difficulty inherent in its detection, it is sometimes included in tables of elementary particles. The conventional graviton is massless, although there exist models containing massive Kaluza–Klein gravitons. Supersymmetry extends the Standard Model by adding another class of symmetries to the Lagrangian. These symmetries exchange fermionic particles with bosonic ones. Such a symmetry predicts the existence of supersymmetric particles, abbreviated as sparticles, which include the sleptons, squarks, neutralinos, and charginos. Each particle in the Standard Model would have a superpartner whose spin differs by ​1⁄2 from the ordinary particle. Due to the breaking of supersymmetry, the sparticles are much heavier than their ordinary counterparts; they are so heavy that existing particle colliders would not be powerful enough to produce them. However, some physicists believe that sparticles will be detected by the Large Hadron Collider at CERN. String theory is a model of physics where all "particles" that make up matter are composed of strings (measuring at the Planck length) that exist in an 11-dimensional (according to M-theory, the leading version) or 12-dimensional (according to F-theory) universe. These strings vibrate at different frequencies that determine mass, electric charge, color charge, and spin. A string can be open (a line) or closed in a loop (a one-dimensional sphere, like a circle). As a string moves through space it sweeps out something called a world sheet. String theory predicts 1- to 10-branes (a 1-brane being a string and a 10-brane being a 10-dimensional object) that prevent tears in the "fabric" of space using the uncertainty principle (e.g., the electron orbiting a hydrogen atom has the probability, albeit small, that it could be anywhere else in the universe at any given moment). String theory proposes that our universe is merely a 4-brane, inside which exist the 3 space dimensions and the 1 time dimension that we observe. The remaining 7 theoretical dimensions either are very tiny and curled up (and too small to be macroscopically accessible) or simply do not/cannot exist in our universe (because they exist in a grander scheme called the "multiverse" outside our known universe). Accelerons are the hypothetical subatomic particles that integrally link the newfound mass of the neutrino to the dark energy conjectured to be accelerating the expansion of the universe. ^ a b c d e f g h i j Sylvie Braibant; Giorgio Giacomelli; Maurizio Spurio (2012). Particles and Fundamental Interactions: An Introduction to Particle Physics (2nd ed.). Springer. pp. 1–3. ISBN 978-94-007-2463-1. ^ Ronald Newburgh; Joseph Peidle; Wolfgang Rueckner (2006). "Einstein, Perrin, and the reality of atoms: 1905 revisited" (PDF). American Journal of Physics. 74 (6): 478–481. Bibcode:2006AmJPh..74..478N. doi:10.1119/1.2188962. ^ Friedel Weinert (2004). The Scientist as Philosopher: Philosophical Consequences of Great Scientific Discoveries. Springer. pp. 43, 57–59. Bibcode:2004sapp.book.....W. ISBN 978-3-540-20580-7. ^ National Research Council (2006). Revealing the Hidden Nature of Space and Time: Charting the Course for Elementary Particle Physics. National Academies Press. p. 68. Bibcode:2006rhns.book....... ISBN 978-0-309-66039-6. ^ Jared Brooks. "Galaxies and Cosmology" Archived 2014-07-14 at the Wayback Machine. 2014. p. 4, equation 16. ^ Calmet, Xavier; De Aquino, Priscila; Rizzo, Thomas G. (2010). "Massless versus Kaluza-Klein gravitons at the LHC". Physics Letters B. 682 (4–5): 446–449. arXiv:0910.1535. Bibcode:2010PhLB..682..446C. doi:10.1016/j.physletb.2009.11.045. hdl:2078/31706. Brian Greene (1999). The Elegant Universe. W.W.Norton & Company. ISBN 978-0-393-05858-1. Frank Close (2004). Particle Physics: A Very Short Introduction. Oxford: Oxford University Press. ISBN 978-0-19-280434-1.